« MechRC Humanoid Back in Stock! Big Blue Saw’s End of the Year Sale! Big Blue Saw’s latest sale starts Tuesday, December 16, 2008 and ends Tuesday, January 6, 2009. With this sale any aluminum 6061 parts of 0.1 inch or 0.063 inch thickness are automatically automatically eligible for a quantity discount — even on orders of as little as one part! This is an excellent opportunity to try our services — you can order just one small part, and save on the setup charges. This offer is valid for orders placed through our online ordering system only. One of the perennial favorite materials at Big Blue Saw, the 6061 alloy of aluminum features excellent strength and light weight. 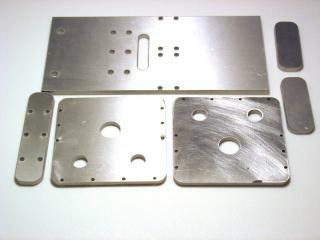 It is weldable and has good corrosion resistance. This alloy is a true “aircraft aluminum”. Among many other applications, it was chosen by NASA to construct the crew cabin of the Space Shuttle. This entry was posted on Monday, December 15th, 2008 at 8:08 pm	and is filed under Announcements, Product Spotlight. You can follow any responses to this entry through the RSS 2.0 feed. You can leave a response, or trackback from your own site.